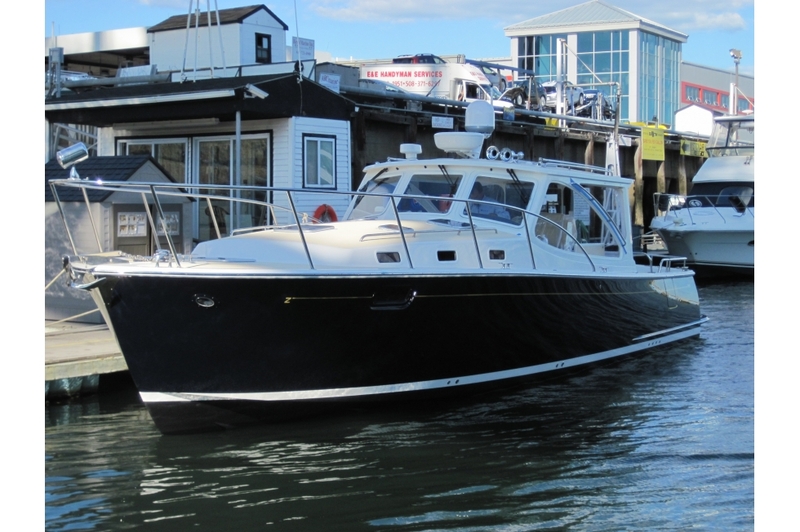 The “Express” differs from the standard “Downeast” model only in pilothouse window styling. The side opening on the “Express” is divided in two parts. The lower section of safety glass has a small, opening vent window forward. This model has more hard glass enclosure if one prefers to partially open the sides in warm, rough conditions. The lower glass enclosure helps to contain small children on the pilothouse seats and also provides a lower handrail on the outside of the window frame by which small children can better work their way forward to the bowrail...instead of having to depend on the roof rails. 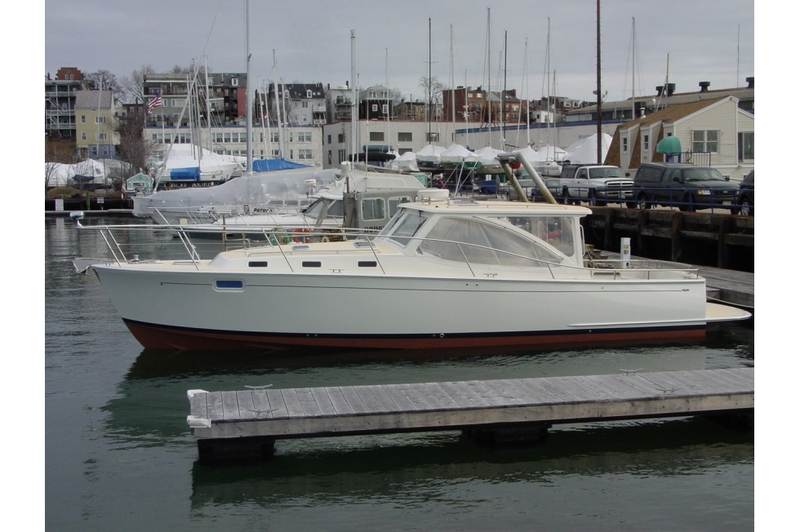 The primary design goal for the 40z was to create a 40 foot powerboat that would handle like a 30-footer at idle speeds in tricky docking situations. The new Volvo-Penta IPS or Yanmar joystick control technology makes this goal a reality. The IPS system works with twin pod drives under the hull and the Yanmar with twin sterndrives. When conventional twin-engine controls are in neutral, a single joystick takes over with fingertip control. There are no thrusters. Through a unique computer program, each drive unit is independently operated in terms of direction, rpm and forward-reverse gear. This new system works far more intuitively than conventional twin shaft drives or joystick/thruster operated jet drives. Dynamic Positioning System (DPS) is standard with the Volvo-Penta IPS. This hovering or 'skyhook' feature is not yet available with the Yanmar sterndrive option. -Side-opening doors (P&S) overcome a common problem, getting aboard or getting off when handling docklines. 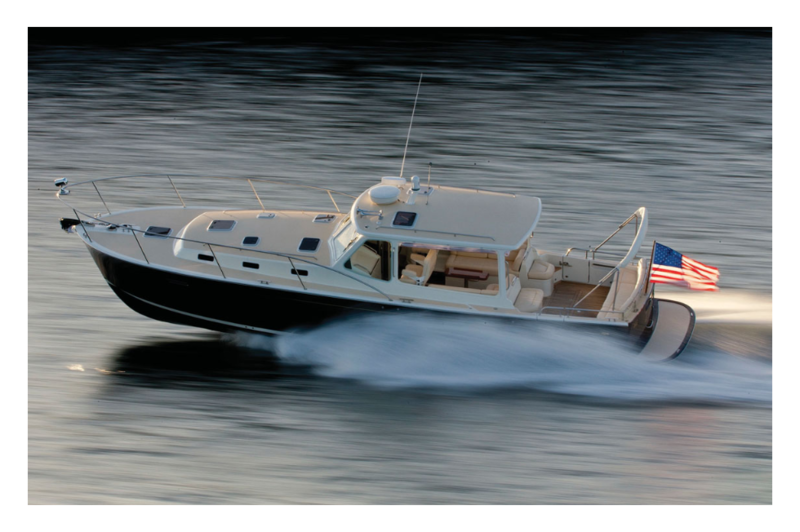 - Roll-up side/aft curtains and fully-opening windshields to regulate airflow in the pilothouse to suit conditions. - Large (60x78) island berth and separate shower in owner stateroom. - Dinette converts to guest cabin with Pullman curtain for privacy. - 40z can be trucked overland without penalty. Width doesn’t exceed 12 feet and height on a trailer is less than 13.5 feet. 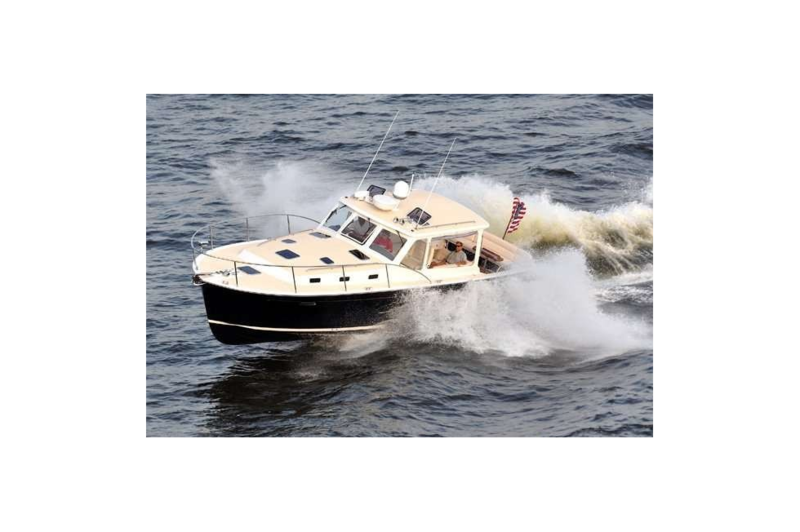 21 gallons per hour at 25 knots, or 1.2 nautical miles per gallon with standard twin 370 hp Volvo D6 diesels and IPS DuoProp 500 drives. By way of comparison: Power & Motor Yacht Magazine boat tests show the Sea Ray Sundancer 40 consumes 29 gph (.86 nmpg) at that speed, while a Cabo 40 or East Bay 45 consumes 37 gph (.68 nmpg). At $3/gal, that’s $1,110 on a 10-hour trip instead of the 40z's $630. Close to home, you’ll average 4-6 gallons per hour on fill-up… just $25 per hour of general use. That's quite remarkable for a powerboat of this size. The 40z carries 350 US Gallons of fuel. Please visit our 40z Gallery for other perspectives. Optional IPS 600 (435hp) or Yanmar 8LV (370hp) diesel sterndrives. Joystick docking control with Volvo-Penta or Yanmar propulsion. Best fuel mileage- environmentally friendly 1.1-1.3 NMPG (20-30 kts). 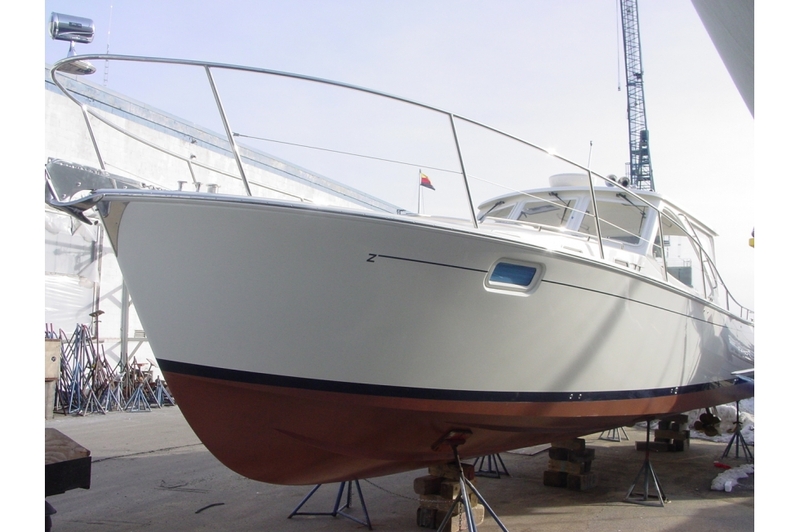 • Modified deep-V, offshore hull design with sharp entry and moderate beam having dual lifting strakes, chine flats, 19-degree transom deadrise carried forward 13 feet, for stability at rest, a dry ride and level acceleration. 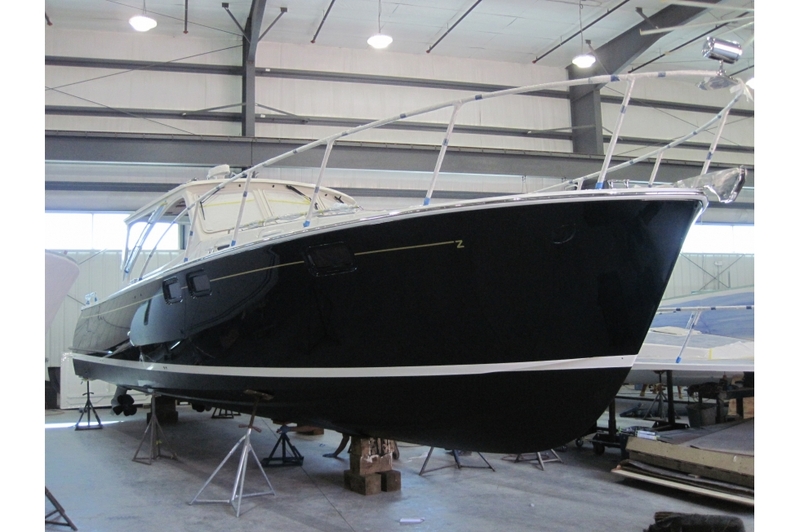 • Hull, cove and chine stripe in Awlcraft 2000 color of choice w/3 coats of clear for abrasion repair. • ISO (CE Mark) Certified for Ocean Category A use and further engineered to meet ISO structural standards for a vessel capable of 45 knots in 21 ft. seas. • “Quiet Chine” modification to dampen wave slap. • Exceptionally strong & light composite construction. Steel rollers outside the mold pre-impregnate stitched biaxial E-glass/Kevlar material under great pressure with Gougeon slow-set epoxy to a 60:40 ratio (glass to epoxy ratio). Damp, compressed material is transferred to and layered into the mold with 1” CoreCell closed-cell foam core then vacuum-bagged to 14.7 psi to compress/bond the laminate and eliminate air voids prior to post-curing at 145F for 48 hours. • Solid keel, stem, and transom corners backed by a structural grid using unidirectional E-glass/epoxy GRP to minimize damage from impact. • Reinforcing of thru-hull and hardware attachments areas with solid glass or Penske-Board. • Transom door to swim platform. • Transferable 10-year osmotic blister warranty. • Bilges painted with smooth, gloss-white finish. • PVC guardrail and quarter-guard with high-polish stainless steel rub strips. • Atlantic 52 hull opening ports (4) in forward cabin and main saloon w/screens & shades. • High-tech composite construction under vacuum using oven post-cured epoxy impregnated, stitched biaxial E-glass with a 1” Alcan Airex C70 cross-linked, closed-cell PVC foam core. • Cook “Armor Flex” off-white gelcoat deck w/sand- textured non-skid. Color optional. • Molded swim platform with recessed dinghy cleats. • Custom Armstrong single post w/treads stainless swim ladder & grab handle. • Hardware areas reinforced with solid glass, high compression Penske Board. • Backing plates for cleats and stanchions are epoxy G- 10 pressure- laminated composite. • Hull and deck fused together as monocoque structure with methacrylate adhesive with shear strength of 3,000 lbs. per square inch and with mechanical fasteners on 8-10” centers. 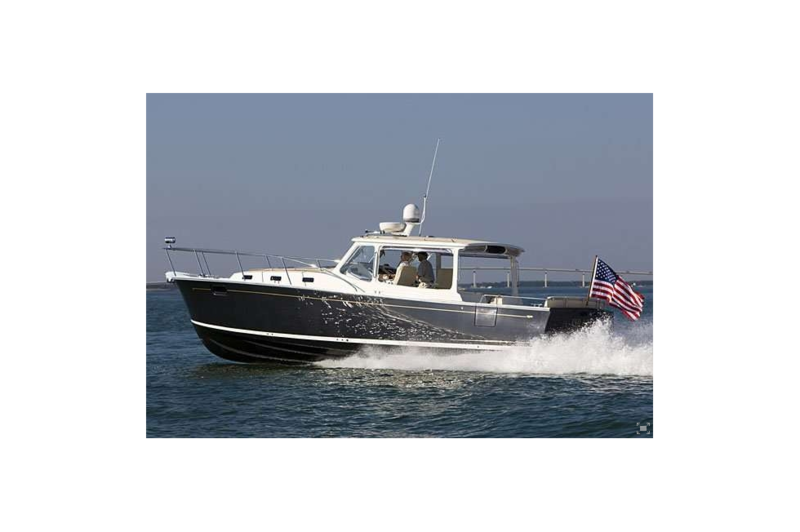 • 316L SS handrails (17) on pilothouse corner posts, hardtop, cabin top, under hardtop, on aft seat backs, galley overhead, outboard on console and either side of companionway entrance. • 29” cockpit guardrail of 1.25” round stainless. • 24” bow rail of 1.25” 316L stainless with 400,000 c.p. spotlight and varnished staff for 16” burgee hoist. • 3’x5’ National flag with teak staff and retainer pin. • Auto-launching polished stainless Lewmar claw anchor w/250’ of rode and 25’ of stainless chain. • Fresh water anchor and rode washer control at helm. • 40' black braided 5/8” docklines (5) and fenders (4) with black fleece covers and air pump. • Convertible pilothouse enclosed by un-zip-and-roll- up-in-place, Strataglas windows with Stamoid border. • Deck drains divert dirt/soot/dew/rain into gray water system and out transom...not onto topsides. • Custom SS multi-directional bow chocks (2). • Engine room access hatches (3) with scuppers, overboard drains, gaskets and lockdowns. Main hatch has electric operated lift arm and manual back up. • Utility room access hatch in pilothouse with custom Armstrong telescoping ladder. • Varnished teak storage drawers w/locks under piloting seats. 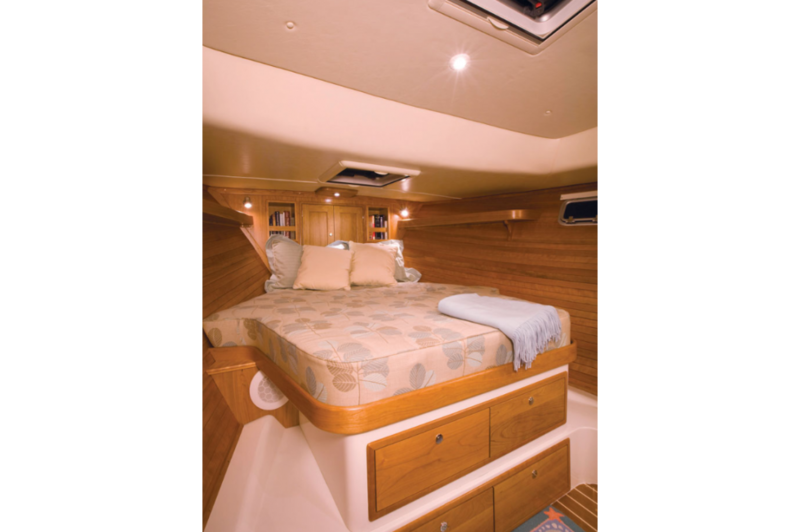 • Large pilothouse settee lockers P&S w/piston- activated lockable lids, vinyl flooring and mesh organizer bags for power cords, hoses, bikes, hard luggage, dinghy and/or golf club storage. • Cockpit seat lockers (P&S) for docklines, fenders, cleaning supplies and lubricants with UltraLeather back & bottom cushions. 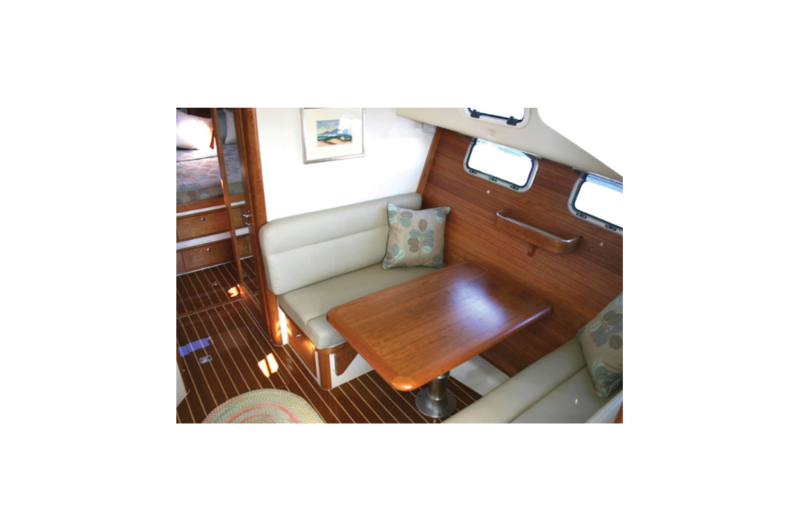 • 36x16 single-leaf gloss-varnished teak table with fiddles w/pilothouse & cockpit sockets. Opens to 32”. 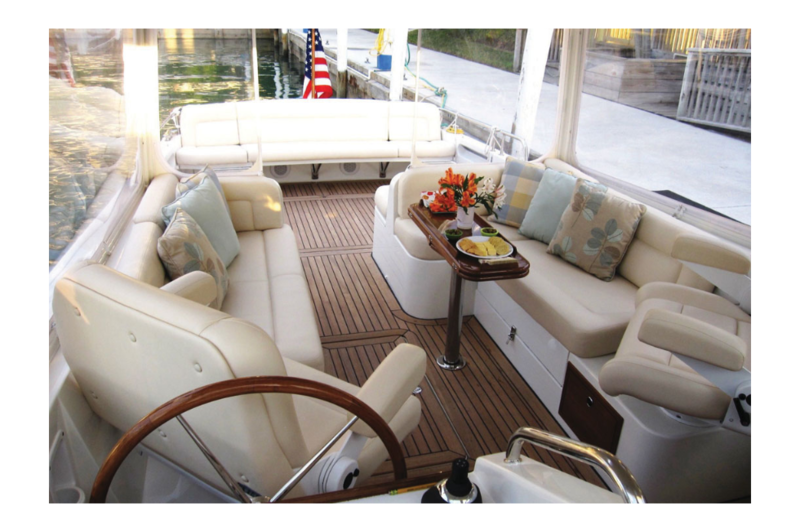 • Pilothouse settees w/UltraLeather covered natural latex, memory-foam bottom cushions...convert to 6.5- foot berths. 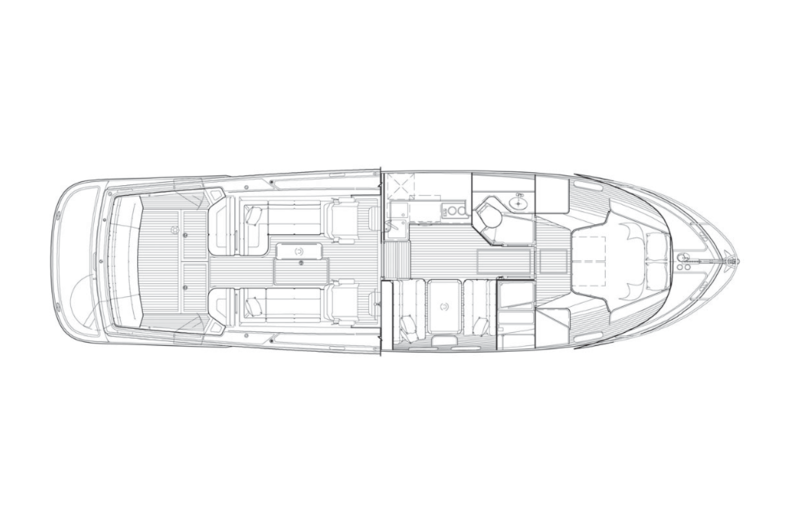 • 8 Lewmar overhead deck hatches in forward cabin (2), head, shower, main saloon (2) and over piloting chairs (2)...all with Ocean dual action shade-screens. • 6 Cabin trunk opening ports w/screens in forward cabin, head, shower, galley and saloon. • Ocean Air combination screen/shades on hatches and pull shades on portlights. 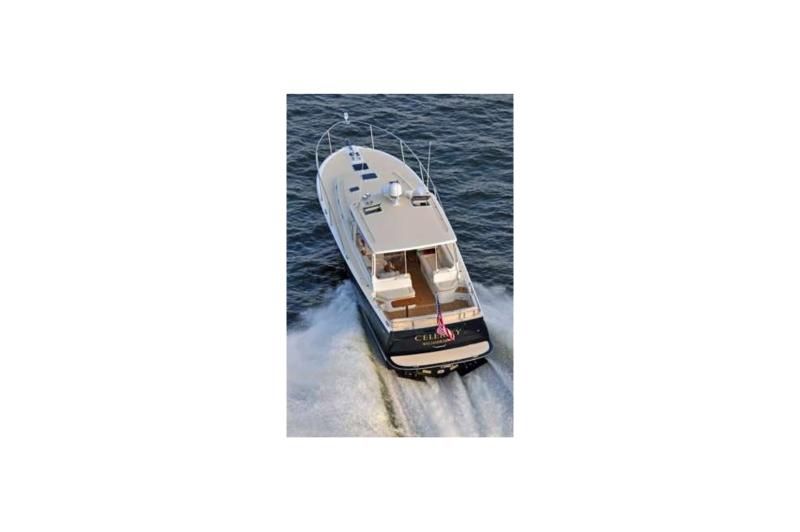 • Gloss-varnished, paneled & louvered, lockable (from inside & out) sliding teak companionway door with 4- section hinged cover with chartbook retainer fiddle. 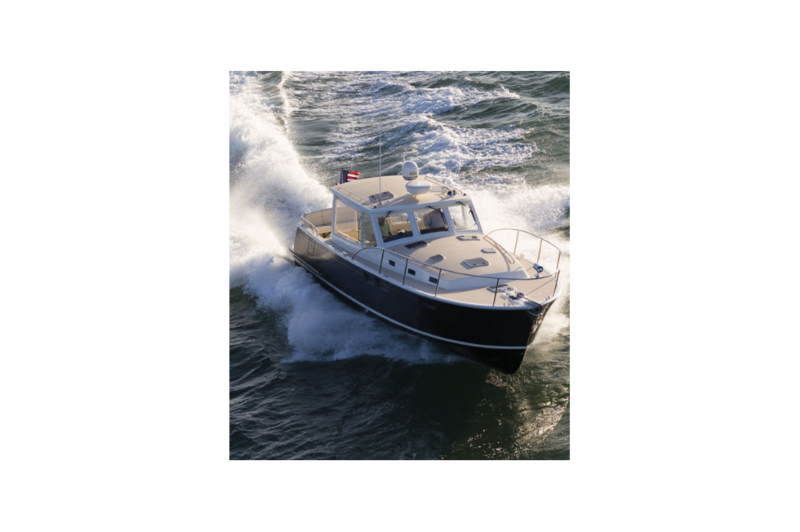 • Transom Seat with UltraLeather bolstered cushions having an easily removable 50z- style stainless framed chair to starboard in way of the transom door and a removable panel to port. • Matched Stidd 500 Wide Admiral low-back, 30” wide, recliner piloting chairs in UltraLeather. Piloting chairs have swiveling bases and telescoping feature that lowers chair to create a comfortable all-weather inside social seating for 8 persons. • Kahlenberg D-OA air horn w/auto fog and anchoring operation. • Raymarine gS165 Hybrid Touch GPS plotter with Wi- Fi for iPad control with radar overlay. • Raymarine 4” square Multi-Function i70 Display to display depth in large numbers. 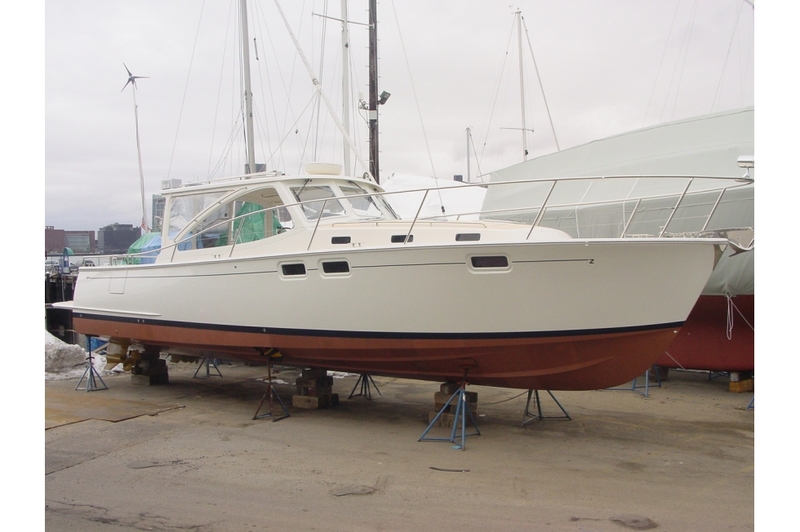 • Raymarine 218 VHF on overhead at helm with hinged whip antenna and RAM control. • Volvo Penta Autopilot Display. • Navionics Platinum+ XL3 mapping software in region of choice as well as US Raster Charts (NOAA Paper Chart) is included in Commissioning Package. • Twin Volvo-Penta D6 370 HP diesel engines with IPS 500 joystick docking system. • Volvo-Penta DPS (Dynamic Positioning System) that holds vessel in GPS location at current heading. • Engine spares kit and service manual. • UL approved fuel shutoff and fuel/air separators. • Two dedicated 175 gallon, bright-finished aluminum fuel tanks. WEMA SUF American standard fuel level sensors and interconnect line with shut-off valves. • Parker 221FR fire resistant USCG Class 1 high- tensile, steel-braid-reinforced, fuel hoses. • Dedicated sump below engine and transmission. • Custom Soundown insulated engine room. • Volvo-Penta standard 125 amp alternators. • LED cabin-reading lights (4) Overhead in galley (4) head (2) shower (2) saloon (4) forepeak (4) piloting console (2) and pilothouse (4) on 4 dimmer switches. • Courtesy lights (3) in cockpit and head. • 700-ampere hour absorbed glass-mat battery capacity with 2- Group 8D 245 AH house and 3-Group 31 105 AH engine and generator-start batteries. • Field serviceable electrical system with bundled & numbered wires w/Deutsch O-ring waterproof connectors. • Fusion MS-AV750 stereo system with CD/DVD plus AM/FM/SIRIUS/VHF/WX/USB and iPod jack; 5 channel 1600 watt amplifier; wireless router; 6-7” speakers; 2-3” speakers and 8” subwoofer in saloon, 400W amplifier, MP3/IPod jack. Starting with #57. • 13-gallon stainless steel hot water heater. • Dockside water inlet w/check-valve and pressure regulator. • High-pressure fresh water (washdown in port cockpit locker w/50 hose & nozzle. • Vacuflush head system with 30 gallon holding tank w/ pump out and macerator discharge. • Back-up Bosworth high-capacity cockpit-operated manual bilge pump. • Centralized gray water discharge system through transom to minimize thru-hulls. • Gray water sump w/inspection port for shower, head, icebox and AC condensate. • Marelon non-corrosive thru-hulls/seacocks with strainers and double-clamped hose. • Corian counter-top with framed and paneled cherry cabinetry with push-button locks & drawer handles and upper storage cabinets with offset inner shelf. • Recessed polished SS sink with removable Corian cover and Scanvik pullout faucet. • Flatware & utensil drawers (3) w/Rubbermaid organizer. • Stainless Vitrofrigo 5.5 cu. ft. 2-drawer reefer/reefer. • B153 Freezer w/4 ice trays in lieu of previous dish drying compartment. • Dry goods cabinet w/sliding doors and intermediate shelf running length of galley w/LED lighting under. • Chinaware & glass storage and rinsing compartment outboard of sink with drain & vent. • Under counter storage locker for large pots/pans and cleaning supplies. • Flip lid access panel to large Rubbermaid trash bin. • Overhead safety handrail and towel drying bar. • Sharp Double Grill 5-Way Convection Oven. • Double stainless hooks for hotpads and dishtowels. • Extended shelf with grab-rail fiddle above galley suitable for chart storage, cutting boards, etc. • Spacious dinette table lowers with electronic control to form 40-44” wide, 78” long berth. Heavy opaque linen curtain anchors to ceiling to form private double cabin with vertical zipper entry. 5” UltraLeather covered memory foam insert is stored in vinyl bag. • Large hull opening ports (2) with screens, skylight hatches (2) and cabin portlights (2) to maximize ventilation, sense of space and light. • The companionway is designed for safety to function like a normal stairway with stainless grab rails and only 2 steps w/shoe locker & tool storage under. • Headroom of 6’4” on centerline. • Clear Awlgrip gloss-finished teak & holly cabin sole with storage compartment for large plastic bins. • Off-white Nevamar HPL paneling with cherry trim with foam backed vinyl headliner & satin-varnished cherry ceiling battens. • Access door to dual entry head with integral shower. • The portside combination head/shower is accessible from either forward or main cabin. • Corian counter with polished stainless oval sink having mixer valve spigot and pullout flexible hose with soft-spray to use as second shower. White Corian sinks to be installed in later models. • Paneled cherry storage locker outboard with sliding doors and towel storage shelf above. • Full-length mirrors inside door. • Towel rings and hooks. • Vent hatch and portlight. • Floor drain to gray water overboard system. • Fixed 78”x 60” island berth having Latex memory foam mattress covered in durable, water resistant quilted Ultra- Leather. • Storage drawers (4) and below-berth storage bin. • Storage shelves over berth (P&S) also serve as handholds when rising from berth. • Framed cherry wood forward bulkhead with recessed bookcases (2) and double access doors to large forepeak anchor locker. • Combination bureau/entertainment center with cabinet, drawer & shoe locker, Corian counter and upper storage shelf. 26” Flatscreen TV option would be mounted in lieu of cabinet door. • Hanging locker to port with storage shelf over. • Private access to head and ensuite shower. • Dressing mirror on forward face of entry door. 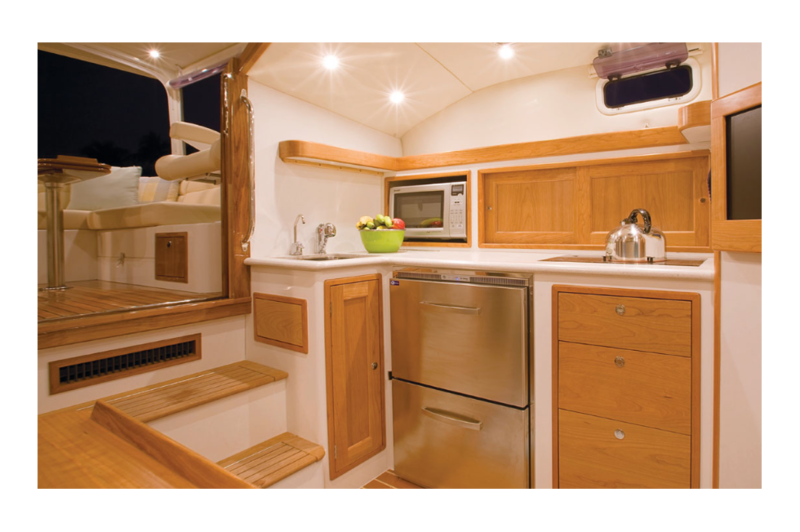 • Separate stall shower to starboard with seat as well as towel & toiletry storage bin outboard. • Wall mounted Scanvik shower hose w/turnoff. • Towel rings and bathing suit hooks. In lieu of the above shower, a 2nd head with sink and shower (wet head) is created by eliminating the door to the forward cabin as well as the passageway door to the port head…and locating an access door to this 2nd Head in the passageway.